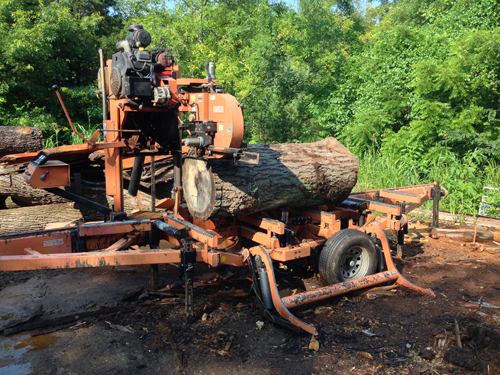 The excitement associated with reclaiming old lumber never seems to fade. 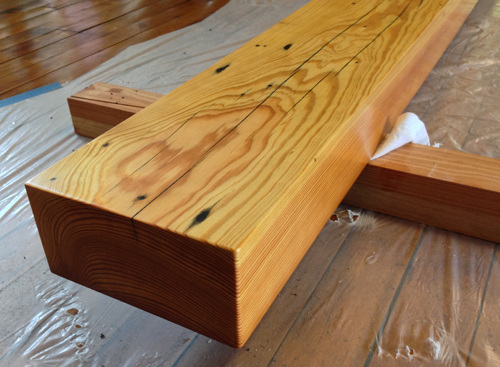 In March my friend Jeff pointed me towards a discard pile at a local construction site, and with the company’s blessing we were able to pick out a selection of beams with some good life left in them. The building was originally a factory built in 1870, so it was full of old-growth pine. The floor boards were a full three inches thick, and even with the grooves trimmed the finished blanks are still a healthy 5 1/2″ wide. 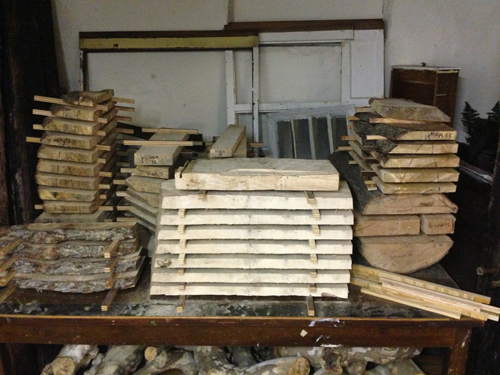 Some re-sawn sections can stretch to seven inches wide. 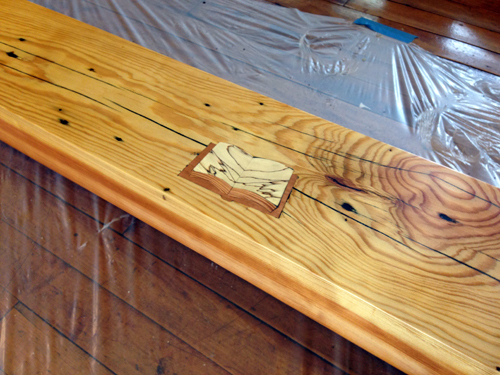 There had been a fire, and most of the wood was coated with a thick layer of soft wax. Although this is likely to affect subsequent finish work, it also has a preservative effect. 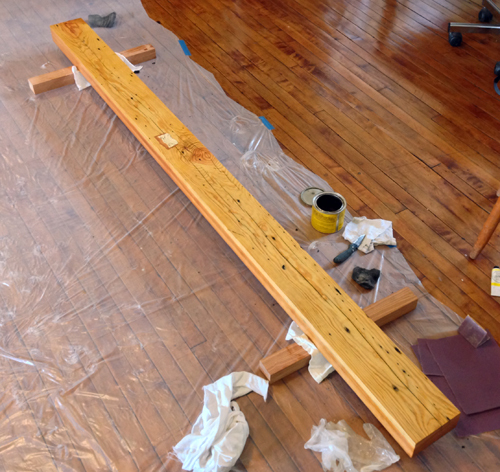 I used one of the beams to make this custom mantel (below) for a friend’s new home. There was some tear-out on the top face of the beam that needed patching, so I decided to try my hand at making an inlay. Since this was for a book artist and a newly married couple, the imagery suggested itself. The finished mantle. Cracks and nail holes, visible on the top face, have been filled with black pigment. 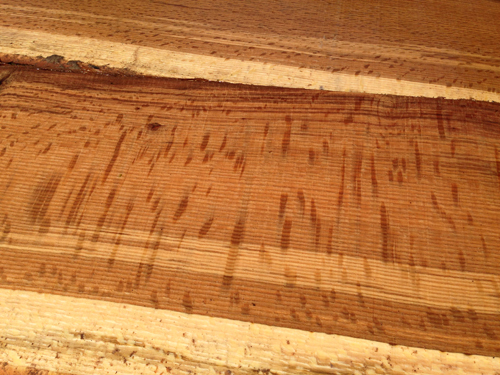 The front face is clear with perfect, rift-sawn grain. 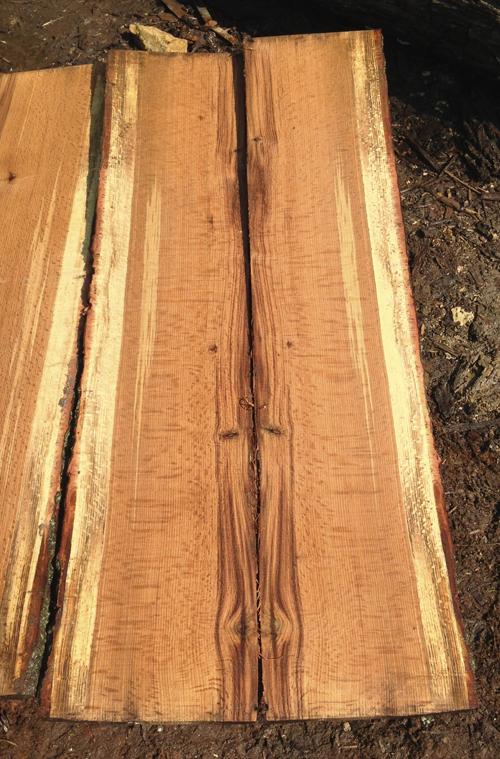 You can get a glimpse of the tight annual rings here, and the shift from the pink heartwood to the blond sapwood. This is the finished inlay, which serves as both a meaningful decoration and a practical patch. Everyone should have at least one book on their mantel, right? 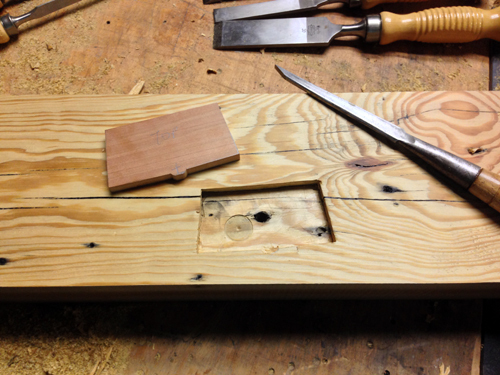 The first step of the inlay process was to clean up the tear-out around a large nail hole, which is visible here in the center of the recess. I used a piece of cherry as the book cover. I needed a couple of book-matched pieces for the pages, of course, and was pleased to be able to trim this spalted maple in such a way as to reveal the "heart" at the top of the book. 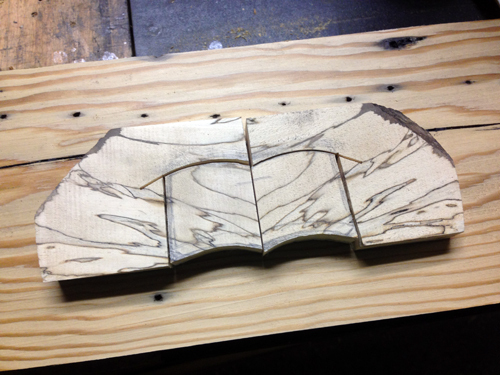 After inlaying these two pieces, I cut two slices of pine with suitably curved grain to create the dimensional effect of the stacked pages (see finished inlay, above). This entry was posted in custom furniture, space and surface works, Uncategorized and tagged beams, heart pine, inlay, John Sarra, lumber, mantel, reclaimed, rift sawn on July 7, 2013 by johnsarra. 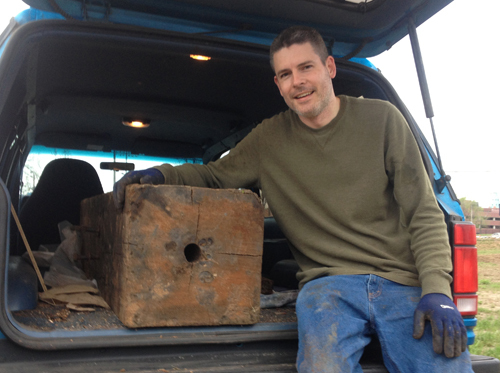 This spring I was fortunate to come across a few good city trees waiting to be salvaged from dump sites. 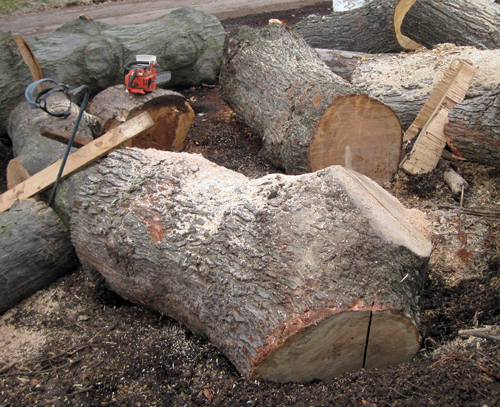 The largest was this maple, pictured below. The lumpy exterior suggested the possibility of a surprising interior, and I wasn’t disappointed. 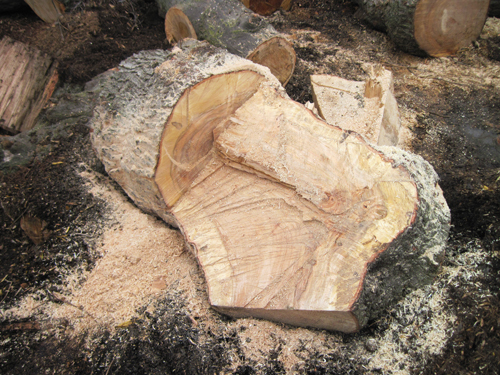 One end of the section was a large crotch with honey colored heartwood and strong figure. The length of the trunk was peppered with clusters of birds-eyes that show up on flat-sawn sections, while quarter-sawing stretches the figure into iridescent ribbons. This was the largest chunk of a tree that I have salvaged to date, and since I was working alone it was necessary to section the wood into manageable pieces. Fortunately, I can manage a large piece. But getting them out of the truck is always easier than getting them into it. I had been wanting to mill up some of the green wood that I’ve been collecting into slabs and planks, so this seemed like a good chance to give it a try. Since a learning opportunity is also a teaching opportunity, I enlisted two of my students to help with the project. 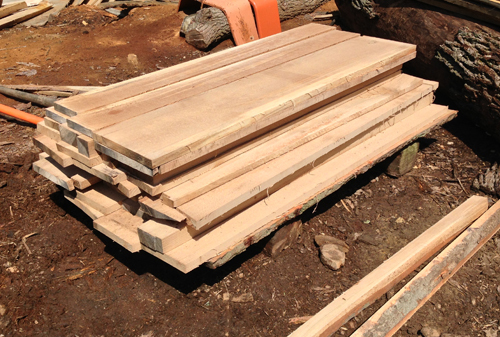 It was an experiment to see how well short stock could be milled on a large capacity band saw rather than on a portable mill. 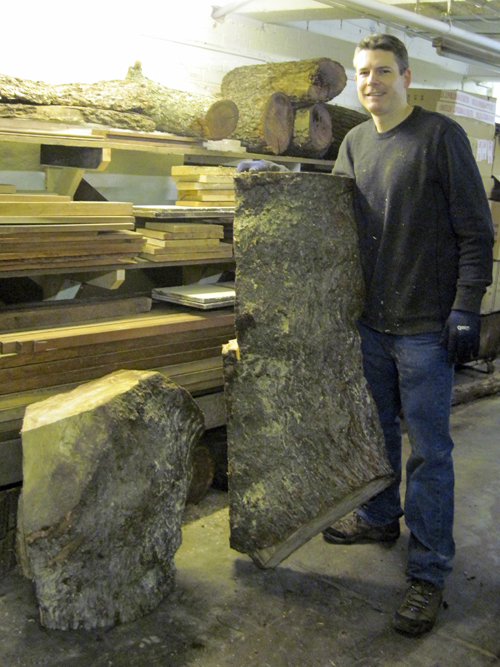 We were successful cutting book-matched slabs out of several sections of the maple, and the wood is now air drying. It should be ready for use by the end of next summer. Many thanks to Michael O. and Zach S. for lending a hand. 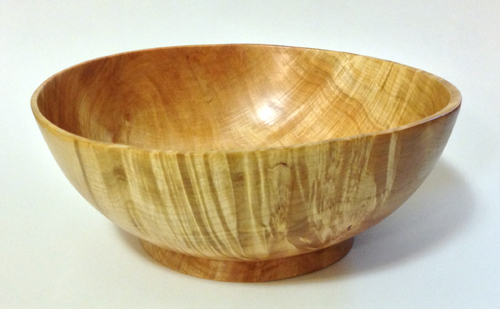 Some of the smaller sections were suitable for bowl blanks, and one of the resulting bowls is pictured below. 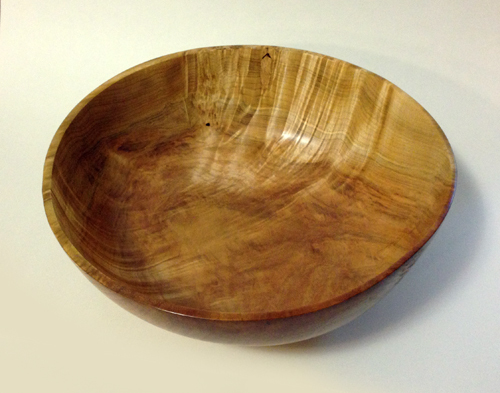 It is about 10.5″ in diameter, and the curvature of the bowl captures the transition of the figure as the orientation of the grain shifts. 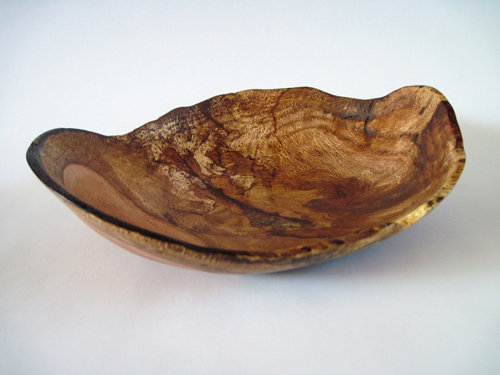 As usual, the wood distorted slightly as it dried. 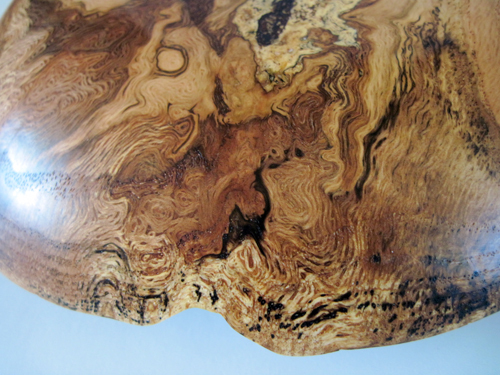 The slight distortion gave the bowl a graceful energy and played up the textural illusion caused by the curly figure. This entry was posted in custom furniture, Uncategorized and tagged birds-eye maple, book match, bowl, figure, John Sarra, maple, milling wood on June 28, 2013 by johnsarra.